This was a fantastic ride and in no way lived up to the dire warning in the calling notice. We gathered at Hayes at 8 am under cloudy but bright skies. We were careful to make sure we didn’t get our ride tangled up with the Bigfoot Ride (level something low) and find ourselves being dragged along at God knows what speed, after all this was a cycle ride in the countryside not a race. After a short briefing from ride leader Eve we were off. The first thing we noticed that with almost no effort we were whizzing along at breath-taking speed. 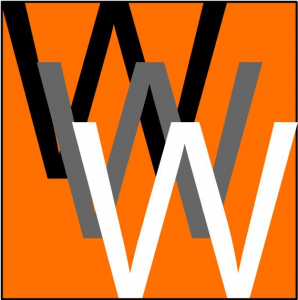 We had that most elusive of all cycling benefits – A TAILWIND. The usual toil up Layhams Road was a breeze (if you’ll pardon the pun). Even Lash Nane was easier than usual. 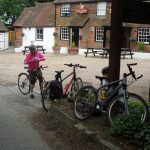 We took the first of the bridleways just before we reached the White Bear. This is in fact a tarmacked surface along most of its length; years ago I can recall taking a car along here when I was looking for sloes to make sloe gin. At Church Lane we turned towards Chelsham Common and here we joined our second bridleway which we shared with some horses all polished, braided and combed, and obviously ready for a show. 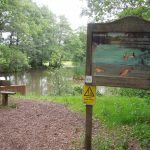 The path was clear, dry and clear of vegetation and we made good progress to Warlingham where we crossed Limpsfield Road into Plantation Lane keeping the deep, steep valley and golf course to our left. There are some lovely views here across Halliloo Valley (what a lovely name). We negotiated a fallen tree which a dog walker said had been down for several weeks – Sustrans this needs some urgent attention it is at a very steep point on the path and would cause severe injury to any cyclist caught unawares. Using a couple more shortish bridleways we cut through to the drive leading to Woldingham School. Most cyclists are aware that whilst this road up the long valley is very pretty and completely traffic free it is also a long climb that can be tiring. But today with the wind on our backs it was pure pleasure. We were soon at and through the school, there was little evidence of activity here, it was still only 9.30 so I guess most folk were still in bed. On the southern side of the school we began the descent off the downs. We crossed the M25 on a bridge; the traffic was heavy beneath us. 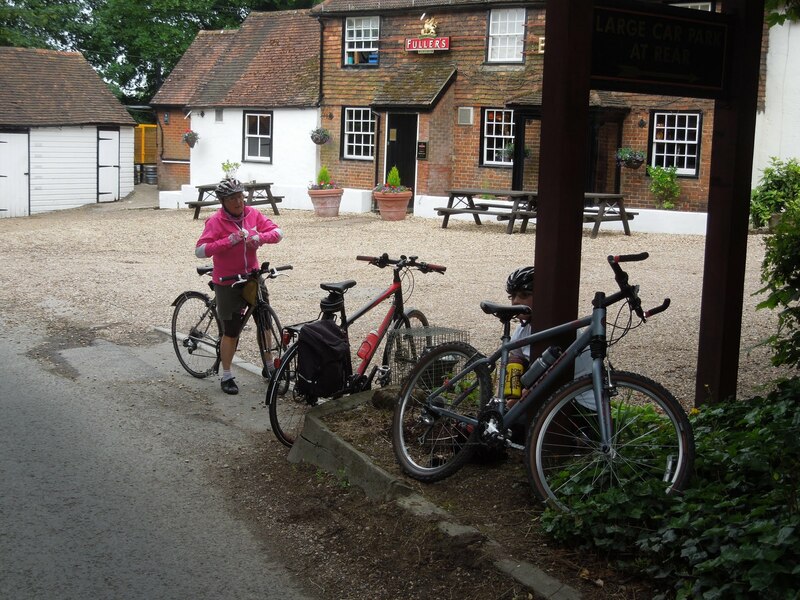 Crossing the A25 we turned into the wonderfully named Bullbeggars Lane and so to our coffee stop at Godstone. The café was pretty full so we sat outside, enjoying our drinks. It wasn’t very warm here so we didn’t linger for long and were soon on our way again. Following the A25 to Bletchingly we tried a little alternative route to avoid the traffic but it was very short, the A25 traffic was surprisingly light anyway. At Bletchingly we turned south towards Outwood and away from the traffic onto the quieter lanes. We paused in the car park of the Bell Public House to have a drink. 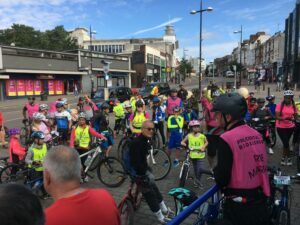 At Smallfield we found ourselves joining the route of the British Heart Foundation London to Brighton Ride. There were plenty of participants and they were making good progress. Our paths soon separated again as we turned towards Copthorne and then to Worth to pick up the Worth Way as per the title of this ride. The rather pretty and historic St Nicholas Church at Worth is estimated to be the 4th oldest in the country and marks the commencement of the Worth Way. The Worth Way follows for much of its route part of the course of a dismantled railway – the Three Bridges to Tunbridge Wells Central Line which was closed in 1967 as a result of the programme of closures put forward by East Grinstead resident and British Transport Commission Chairman, Dr Richard Beeching. The surface is hard packed and good to ride and of course level, we made excellent progress here averaging over 14 mph. There were plenty of other cyclists and walkers sharing the path too. It was a little sad to pass the long disused stations along the way. We reached East Grinstead at about 12.30 and stopped for a short comfort break but decided to defer lunch for another ¾ of an hour so as to revisit the Anchor at Hartfield. 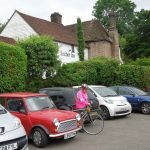 We cycled through East Grinstead and picked up the Forest Way which also follows the line of the above mentioned Three Bridges to Tunbridge Wells Railway. Once again we were able to make excellent progress and soon reached Hartfield where we were ready for lunch. 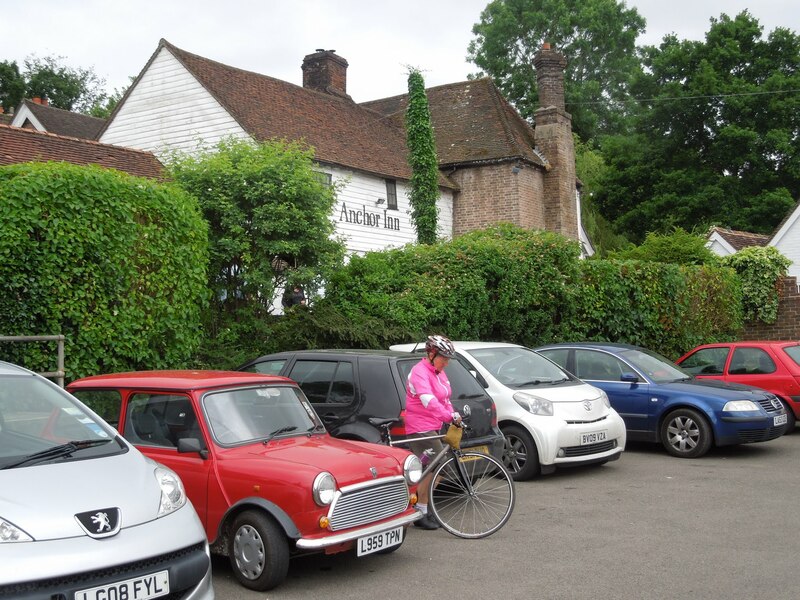 The Anchor Inn was packed, there was a village cycling event marking Bike Week and the pub was obviously being used as a checkpoint. We managed to get a table indoors despite a number of tables being booked for Father’s Day celebrations. The food was plentiful and we were about an hour here before we decided that we had better press on. 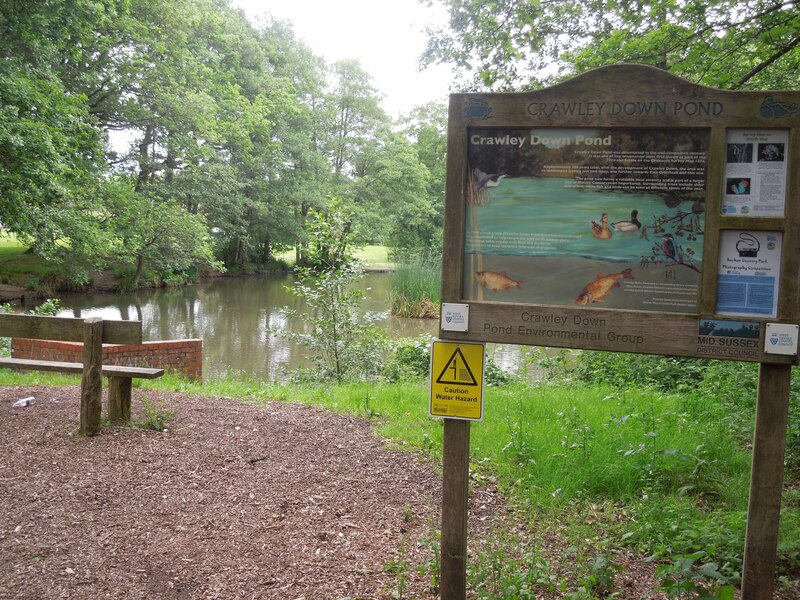 We rejoined the Forest Way and continued to Groombridge where we toiled up Groombridge Hill. By now we were heading due east and then north so we no longer enjoyed the benefit of the tailwind. We passed the entrance to Finchcocks where there is a fantastic collection of antique keyboard musical instruments. Many years ago I went on an outing to Finchcocks with my children’s piano tutor. We were met at the front door by a most stern and forbidding man who was the curator I believe. He went on give one of the most entertaining presentations I have ever seen. Wonderful! 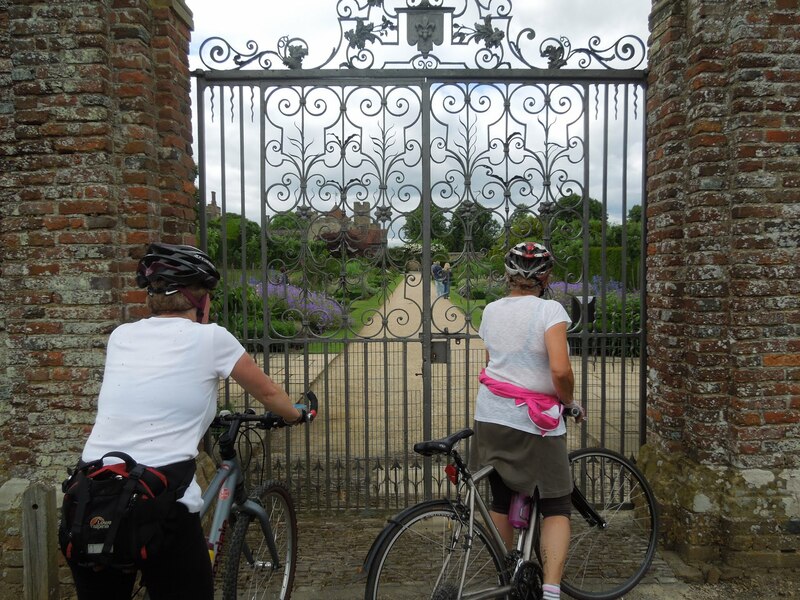 We continued to Penshurst Place where we paused to look through the ornate gate into the beautiful walled garden. 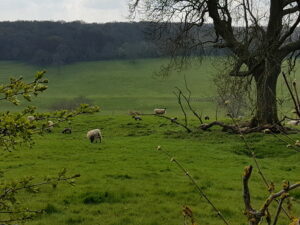 Here we were entertained by a couple of skylarks warbling as only skylarks do as they hovered over the fields stretching as far as the eye could see across the High Weald. 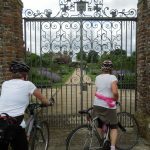 The journey from Penshurst Place to Tunbridge Wells is on bridleways and paths alongside the River Medway. We were tired by now. On arrival at Tunbridge Station we had only a short wait for the train and soon we were zooming homewards. A wonderful ride: 55 miles, Time: 6:37:04, Moving Time: 5:45:56, Elapsed Time: 8:40:10, Avg Speed: 8.2 mph, Avg Moving Speed: 9.4 mph, Max Speed: 31.3 mph.